I live in an apartment. I come home and take the elevator up to the third floor. It’s not a fancy elevator. It’s one where you are keenly aware that you are in a metal box being transported between stories. This particular one has a gap between the elevator itself and the floor. You can see this gap as you step across it. It’s like a gaping abyss. But smaller. I’ve always been afraid of bottomless holes. Of spaces where you can never stop falling. The gap between the elevator and the building always feels like one of those to me. I grasp my keys that much tighter. Because to drop them down there would be to be doomed. Or at least, that’s what it feels like. Today, I went to a baby shower. These two things shouldn’t feel connected. But for me, they are. The last baby shower I went to, before this one today, was my own. To me, they represent hope. They represent possibility. They are all about what is to come. And for the guests that means childbirth, and being a mother in all its challenging glory, but nowhere in those expectations is what I experienced. I feel like parents like me, parents of kids who fall outside the category of “as long as it’s healthy,” dropped into that gap between the elevator and the building when we had our children. We expected to get on the elevator. We were told that was what was going to happen. And suddenly we were looking up saying, “What? Why us?” We heard ourselves and others say at our baby showers, “five fingers, five toes, healthy and normal” as if anything else was out of the question. I should have never had to feel like this was anything but normal. When you are pregnant you have all these ideas of what parenthood is. So many of them are wrong or misguided. But most of them are not as far off as the reality a special needs parent faces every day. Every parent has to adjust to the reality of parenthood. But when even the horror stories of breastfeeding and colic seem like fairy tales, it can be hard to accept that this indeed is your normal. The baby shower today was lovely. I felt hopeful and excited for the mother to be. But I also felt cheated, and sad, and like I had seen something that had ruined it for me. I saw the other pregnant woman who were talking about realistic concerns like birthing plans and whether they would have a water birth or an epidural and I felt like an outsider. Like a cynic. My journey involved finding out my daughter, Eva, was blind and deaf within days of her being born. It involved finding out she had multiple heart and brain abnormalities within the first week of her life. It meant giving up on breastfeeding and then bottle feeding. It involved hospital stays and frightening illnesses and never really knowing what the future would hold. While she had 10 fingers and 10 toes, she was not healthy, she was struggling to breathe, the smallest cold put us in the PICU and I was left feeling that somehow I had missed the boat, fallen through the crack, been left behind. My journey of motherhood is not everyone’s, and I felt more than ever the need to reach out to those other mothers like me. To know we are not alone. To normalize our experiences of motherhood so we don’t have to feel like we have fallen in that gap between the elevator and the floor. So we can feel like our experiences are normal and valued and worth talking about. So we can feel like that hope and wonder and joy at a baby shower doesn’t need to end if our baby turns out to be Eva or one of the other one in a million babies. Follow this journey on The One in a Million Baby. Tessa Prebble is a high school journalism and media teacher from Wellington, New Zealand. 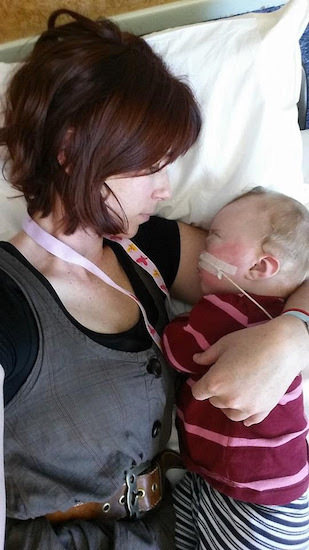 Her daughter, Eva, was born in April, 2014 and was diagnosid with CHARGE Syndrome. Eva was blind and deaf and had brain and heart abnormalities. She was tube fed and had low muscle tone. Eva died unexpectedly on February 2015. Tessa has told her story and Eva’s through her blog The One in a Million Baby. Tessa also produces a podcast which tells the stories of other special needs parents and their journeys in an effort to help new parents of babies like Eva feel less alone.